Some artists are doomed to languish in obscurity. Unfortunately, Theodore is not one of them. OK, But What’s It Really About? In We Have Never Been Modern, Bruno Latour identifies the distinction between nature and society that characterizes modernist thought. He claims that such thought ignores the hybridization that is always occurring between science, society, and discourse. Latour speaks little on the subject of art, leaving one to wonder whether modernism as an artistic movement is necessarily tied to the idea of modernity in social sciences. In any case, parallels may be drawn between the targets of Latour’s criticism and historical movements within the arts that have been labeled modernism, postmodernism, and the avant-garde. Modernism and postmodernism have easy corollaries in Latour’s text, but the avant-garde, which emerged as a challenge to modernism in the arts, poses a dilemma. Does its stated goal of deinstitutionalizing art and radically integrating it with life align the avant-garde ideologically with Latour? 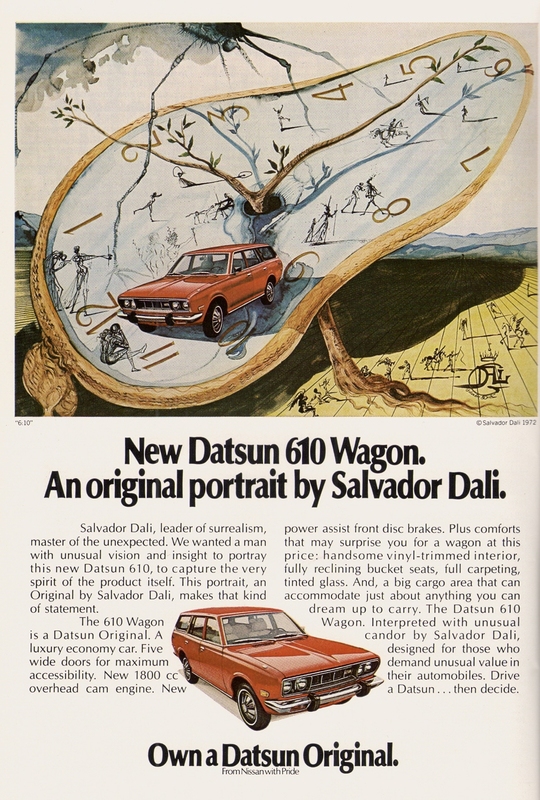 Salvador Dali’s 1972 ad for the Datsun 610 Wagon. 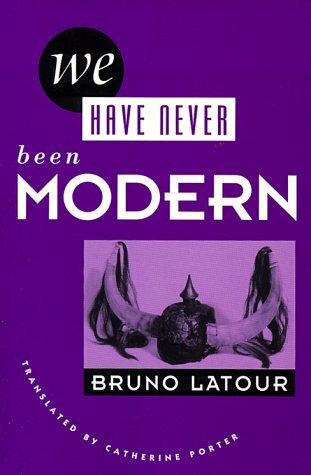 Bruno Latour’s We Have Never Been Modern takes a revisionist approach to social modernity that translates well to an interpretation of modernism in art. His text explores modernity’s division between nature and culture; he argues that the separation between these two realms, a process by which the West is “modernized” and made distinct from other pre-modern cultures, leads only to a proliferation of nature-culture hybrids, matters that blur the distinction between the real, the social, and the discursive. For us to be modern, there could be no link between purification (the act of separating nature from culture) and hybridization. For Latour, the link does exist, so we are not modern. Modern art follows what Latour calls the modern constitution; in other words, modernist art “develops out of high culture but is sharply critical, even deconstructive, of certain high-culture values” (Naremore 9), and it is aware of its position in history. Just as modernist art is borne out of modernity, so is postmodern art borne out of postmodernity. Latour is highly critical of postmodernity, dismissing it as “a symptom, not a fresh solution. It lives under the modern Constitution, but it no longer believes in the guarantees the Constitution offers” (46). Likewise, the artistic avant-garde is so named for its perceived position at the forefront of society, yet seems always on the verge of “deserting” that society. 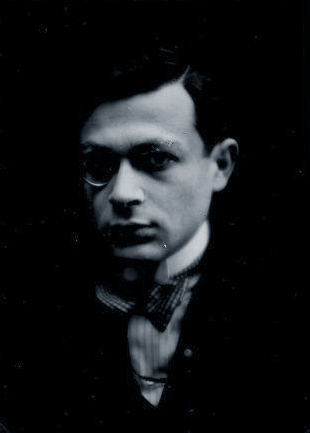 Tristan Tzara, founding member of Dada. “We don’t accept any theories,” writes Tristan Tzara in his 1918 Dada Manifesto. “Do we make art in order to earn money and keep the dear bourgeoisie happy? . . . A work of art is never beautiful, by decree, objectively, for everyone. Criticism is, therefore, useless; it only exists subjectively, for every individual, and without the slightest general characteristic.” With such antagonism toward institutional boundaries in art, the question arises: Where does the avant-garde fit into an art-historical reading of Latour’s critique of modernist thought? For an answer, one can turn to Renato Poggioli’s definition of the avant-garde as a “culture of negation” (107). It would appear that the stated goal of the historical avant-garde, to abolish the autonomy of art and thus eradicate the boundary between art and life, sits comfortably beside Latour’s project. However, consider Bürger’s assertion that the avant-garde failed in its mission to integrate art with life. In fact, the avant-garde’s failure is directly attributable to its desire to achieve this integration, since that desire is predicated on an acceptance of capitalism’s claim that art can exist as a secular religion that transcends commodity relations (Home). A key characteristic of Latour’s argument is his approach to temporality: “We have never moved either forward or backward. We have always actively sorted out elements belonging to different times. We can still sort. It is the sorting that makes the times, not the times that make the sorting” (76). Latour sees social avant-gardism as being no different from postmodernity, insofar as both implicitly situate themselves within a historical trajectory. He describes postmoderns as being “simply stuck in the impasse of all avant-gardes that have no more troops behind them” (62). Viewing Latour through an art-historical lens, one sees not that the true avant-garde ceased to exist long ago, but that a true avant-garde has never existed at all. It can be argued that most, if not all, experimental techniques utilized in commercial works have precedents in the avant-garde. However, it is no less true that most such techniques in avant-garde works have precedents in other avant-garde works—and for that matter, in commercial ones: Duchamp could not have produced his ready-mades had they not already been made. For Arthur Danto, modernism ended with “the emergence of the appropriated image—the taking over of images with established meaning and identity and giving them a fresh meaning and identity. Since any image could be appropriated, it immediately follows that there could be no perceptual stylistic uniformity among appropriated images” (15). The avant-garde community is and always has been a part of the system of which it is inherently critical. At the same time, that system has generated countless hybrids that complicate the very notion of a separation between “mainstream” and “avant-garde.” This is made evident by surveying historical developments in popular media, including commercially released films, television programs, corporate advertisements, promotional music videos, and popular music recordings. Since capitalism tends to be viewed by Benjamin, Greenberg, and other Marxist critics as a problem that needs solving, special attention should be paid to American works that explicitly suggest a profit motive. The examples that follow do not purport to be representative of all media. Most of them originate from the late twentieth century, particularly the 1960s, because that was an especially adventurous era for popular culture, music, and films made both inside and outside of the Hollywood system. It is not being argued that these are examples of avant-garde works that somehow managed to creep into the mainstream. Instead, these instances are mentioned with three goals in mind: to illustrate the long history of avant-garde/mainstream hybrids; to establish that the incorporation of innovative or progressive artistic methods into commercial mainstream media does not negate the historical avant-garde’s mission to bridge the gap between art and life, but in a sense achieves it; and to debunk the portrayal of the “average” person in a capitalist society as the victim of conditioning, which has left him or her unable (or unwilling) to consume anything more complex than kitsch. The extent to which avant-gardism was embraced by 1960s popular culture for its ability to portray, simulate, and enhance hallucinogenic drug experiences cannot be overstated, and some of the most experimental and formally subversive films to reach a wide audience during the decade were projects involving pop stars. Among these was Bob Rafelson’s 1968 film Head, starring the Monkees. If Head fails as a commercial film, but also “fails” in the eyes of the avant-gardists who might appreciate it more if it didn’t star the Monkees, then such a film can only exist somewhere in between—or rather, in a realm where these oppositional forces do not exist, where commercial product and art can apply to one and the same thing. Historically and as a whole, network television has been taken less seriously than even the most frivolous commercial cinema, but it has nevertheless shown occasional traces of avant-gardism, particularly in its early days. Through the 1950s and until his death in 1962, comedian Ernie Kovacs hosted several experimental television comedy programs that tested the limits of a medium still in its infancy. Alongside conceptual gags and surreal humor, Kovacs broke the fourth wall, exposing the behind-the-scenes workings of television and making several technical innovations in the process. As Ann-Sargent Wooster suggests, the roots of video art could be traced, in part, to Kovacs’s 1952 experiments with distorting the signal (207). Within the medium of television, the most compact format for appealing to consumers is the commercial. One might argue that the impact on American culture by the classical avant-garde movements, specifically surrealism, is most evident in advertising. Filmmaker and original surrealist Luis Buñuel—whose first film Un Chien Andalou (1929) was a collaboration with fellow surrealist Salvador Dali (who went on to star in commercials in the 1960s)—has proven a major influence on TV ads, insofar as they use unexpected juxtapositions to momentarily shock the viewer into taking notice of what is being advertised (Beebe). The connection is a natural one: influenced by psychoanalysis, the Surrealist movement was largely about desire, while the aim of commercials is to arouse interest and stimulate desire for a product or service. For Greenberg, this would point to the avant-garde being “looted for new ‘twists,’ which are then watered down and served up as kitsch.” However, considering Greenberg’s insistence that the enjoyment of kitsch requires no effort on the viewer’s part, some commercials do not qualify as kitsch; certainly, the more abstract and surreal ones do not. This is evident even from a small sampling of scenarios used in commercials from America and abroad: An iguana watches as a helicopter drops a giant box of cigarettes into a swimming pool (Benson & Hedges); a gorilla in a recording studio performs drums to Phil Collins’s “In the Air Tonight” (Cadbury); a man laments the tragic circumstances of his ability to transform everything he touches into candy (Skittles); a stubborn young boy tells his parents that only actor Robert Loggia could convince him to drink orange juice, after which Loggia enters the kitchen to extol the benefits of calcium (Minute Maid). Not only are these scenarios comically surreal, but the tenuous connections to the products they advertise also encourage intellectual engagement, however small, on the part of the spectator. A yet higher level of audience engagement was required when Senator Mike Gravel, running for president in the 2008 Democratic primaries, garnered attention for his unusual campaign ads. In one, he stands next to a lake, staring silently at the camera for one minute, then picks up a rock, throws it into the water, and walks away. At the time the video surfaced, Gravel’s press secretary explained the “meaning” of the video: “Where he’s coming from is that, it’s less about him coming across with a heavy political message in this video, as much as it is the message of the impression the viewer will have, looking at him” (Kleefield). This specious explanation only reinforces that Gravel was attempting to subvert the form of the political ad. Were performance art to become more common among politicians, Gravel would be seen as a pioneer. In addition to surrealist methods, the aforementioned psychedelicism was also used in corporate advertising to appeal to the youth culture and counterculture of the 1960s and 1970s. Television commercials provided a fertile creative ground for computer graphic designers and visual effects artists. One such artist was Robert Abel. Abel used a “candy-apple neon” technique to create immensely detailed, highly stylized animated commercials for several products, notably 7-Up (Campbell). Suggesting a meeting between visual artist Peter Max and experimental filmmaker James Whitney, Abel’s work was unique in its own right. It was indeed being used to advertise a corporate brand without irony, but that does not cancel out the artistry in what Abel achieved. If anything, the presence of art in something as utilitarian as a television commercial is evidence that art and life are integrated, and that a division between them only exists where the individual perceives that it does. Turning to music, one discovers in Frank Zappa an artist whose accomplishments could qualify him as both an avant-gardist and a “pop star,” and whose self-marketing strategy allowed him to disseminate unusually complex ideas to a wide audience in the form of entertainment. Zappa’s song lyrics consistently mock American society and consumer culture, but he was quite serious in asserting his preference for the capitalist mode of production. This is important because, though he was best known as a rock guitarist and satirist, Zappa was also a composer of highly experimental orchestral works that posed potential difficulty for both performer and listener. His albums routinely juxtapose these works with more familiarly structured pop songs. This makes Zappa’s output a challenge to digest, not just for high-minded classical listeners who want little to do with pop, but also for a larger audience drawn to his sophomoric humor and novelty tunes. One of his more stylistically uniform albums, The Perfect Stranger, is comprised entirely of contemporary classical and electronic compositions; nevertheless, in the liner notes Zappa writes: “All material contained herein is for entertainment purposes only, and should not be confused with any other form of artistic expression.” In interviews, he insisted that his music was entertainment, and that no one should ever be forced to hear music that someone else has deemed artistic (Wragg 206). Zappa’s music is by no means an avant-garde rallying cry for the elimination of institutional high-low distinctions; it merely represents one artist’s total disregard of such distinctions. That his oeuvre is typically categorized as “popular” in record stores and elsewhere, yet sits most comfortably next to the work of comparatively obscure avant-gardists, is a testament to his ability to communicate challenging ideas to a wide audience through ingenious marketing (or frankly, high visibility via self-promotion). It also challenges Greenberg’s notion that “true” culture could never intentionally integrate itself into our productive system, and demonstrates that Zappa envisioned an “average” American consumer who was open-minded, intelligent, and curious. Just as it has challenged long-standing modes of art- and entertainment-based production and distribution, new media raises its own set of questions about the avant-garde. Socially speaking, the Internet provides an excellent example of the laxity of a democratic society toward dissent among its own members, with copyright law being one established norm that has been seriously threatened. Returning to film as an example, a major studio does not want its product to be made available for free via the Internet because it depends on the sales of that product to generate revenue. However, many experimental filmmakers are equally reticent to post entire works on the web. This is not just for financial reasons: the global availability of an avant-garde work threatens to diminish its mystique. Experimental filmmakers are frequently concerned about the method by which a work is being screened, preferring film projection, or in any case, not a low-resolution YouTube video. For some filmmakers, home viewing on a DVD is unacceptable for a work that was shot on film and ought to only be screened on film. A fair number of avant-garde films both old and new have been made commercially available on DVD, but they are only a small fraction of what could be made available, were there not such a puzzling reticence on the part of filmmakers to distribute their work for private home use. Despite an emphasis on preservation in the discourse on experimental cinema, there is a sense that some living filmmakers wish to protect their own films from being screened to as wide an audience as possible. The major studio’s profit-driven “give the people what they want” philosophy contrasts with the avant-garde filmmakers’ “give the people what we believe they need” alternative, but in either case the work itself takes the experience of the audience into consideration. The major difference is that the profit-based approach is more likely to acknowledge the audience’s choice in patronizing the movie theater, and will implicitly take a stance (however condescending) of gratitude, while the alternative sees itself as the cultural antidote to the insidiously formulaic mainstream cinema. Avant-garde film maintains its status as an institution, one operating on the outskirts of commercialism—except on those occasions when admission is charged. Though James mentions “the diversity of non-studio film practices,” it is worth adding that he does not call for a radical transformation of the film industry; like Latour, he is simply advocating a change in perspective. The distinction between avant-garde and mainstream could likely end with the increased stimulation of public interest, and that is best achieved through the marketplace. It is conceivable that a television viewer in the 1970s, seeing one of Robert Abel’s commercials, would be just as compelled to seek out experimental animation as he would be to go buy a 7-Up. If many Americans are, as Greenberg puts it, “insensible to the values of genuine culture,” that doesn’t mean they have been hopelessly brainwashed. Whether they develop a curiosity toward an artist’s work depends, more than anything else, on the effort made by the artist to generate interest. The integration of art with life would eliminate the need for an avant-garde. For any movement calling itself avant-garde, “success” would be its own demise. Many artists and innovators take a position against the capitalist system, but just as many have no qualms about working within that system, and the latter group’s contributions to their art should not be ignored simply for their complicity in corporate success, or their own well-deserved financial remuneration. All artists, no matter how opposed they may be to “the system,” are partly responsible for keeping that system in place, just as the system is responsible for those artists’ ability to keep producing art, and voicing dissent. Latour ultimately suggests in We Have Never Been Modern that society should retain most of the modern constitution, but reject the illusion that modernity is somehow cut off from the past. After acknowledging that its greatness stems from hybridization, society can move onward, continuing to produce hybrids. The avant-garde will never achieve the goal of reintegrating art into the praxis of life; it can’t. The only way that a unity between art and life could be possible is if that unity has existed all along. It is not through avant-garde works but through translation, the proliferation of hybrids, that we see that such a unity has always existed. Adorno, Theodor. Aesthetic Theory. Minneapolis: Minnesota UP, 1970. Bürger, Peter. Theory of the Avant Garde. Minneapolis: Minnesota UP, 1984. Danto, Arthur. After the End of Art: Contemporary Art and the Pale of History. Princeton: Princeton UP, 1997. James, David. Allegories of Cinema: American Film in the Sixties. Princeton, NJ: Princeton UP, 1989. Latour, Bruno. We Have Never Been Modern. Cambridge, MA: Harvard UP, 1991. Poggiolli, Renato. The Theory of the Avant-Garde. Cambridge, MA: Harvard UP, 1968. Spalding, James. The Eclipse of Art: Tackling the Crisis in Art Today. Munich: Prestel, 2003. Tyler, Parker. Underground Film: A Critical History. New York: Da Capo, 1969.